Horse Lovers Camp is a week long overnight camp for horse lovers! 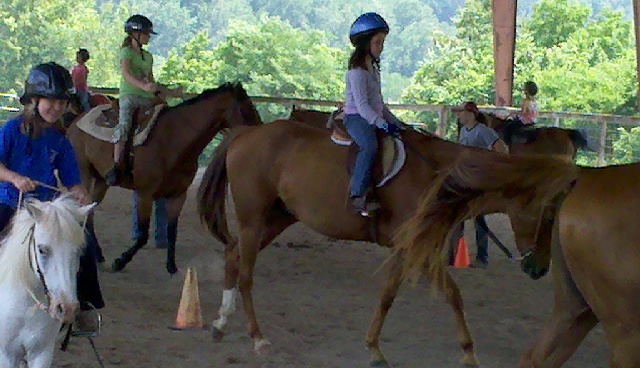 Every camper is assigned their own horse to care for for the entire week. They will learn the joys of bonding with one animal as well as the not so glamorous side of daily horse care! Our Campground this year will again include a campfire ring. Sleeping accommodations will include a large, spacious tent equipped with cots and lighting, supervised by a Camp Counselor. Meals & Indoor showers are provided. The cost of the Horse Lovers Camp is $750/week. 4:00 pm – free time – campers settle into their tents, rest, read, play games etc. 6:30 pm – Movie time – Secretariat, Wild Hearts Can’t be Broken, Dreamer, Sylvester etc.